Most all art shows require white tents. I do not recommend getting a colored tent. While many of these colored tents are less expensive, the light weight design is more for sun shading and not art shows. It is common for these lightweight tents to easily fly up in the air, especially if not properly weighted down on windy days. This can result in damage to your art, nearby booths or customers as they come down. Also these colored tents will pass on the colored roof color on to your art as a color cast. 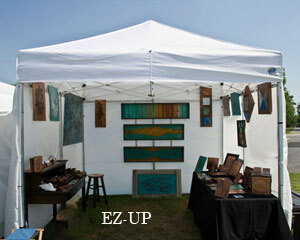 The most common tent found at smaller art shows and many larger art shows is made by EZ-up or are EZ-up type tents. They are quick to put up and take down which is a major advantage. These type of tents are referred to as pop-up tents and most people can put up and taken down this type of tent by themselves. When you first start using your tent, you may want to ask for some help until you get the hang of it. I feel they are fine for the small or occasional weekend art show. They will not hold up as well in bad weather as the better tents will but I see them used by new artist to full time professional artist. I have seen cheap EZ-up tents crushed by overnight storms. Many artist will put up one to three sides during the show to give the tent area some shade to protect them from the sun as it travels across the sky. Another reason to put up your sides is to give a clean white or less distracting background to your hanging art. Many times I decide what sides to put up based on the location of my tent. If I have no one next to me, I may put artwork on both sides of one wall and then not put up my sides on that wall. If you leave your tent up overnight, you should put all four sides up before you leave. For one day shows, I sometimes have one or two sides in my vehicle in case I choose to put them up later in the day as needed. You want your tent to come with walls or sides. I like the walls that have zippers to connect the tent walls to each other. Some tents come with out zippers and some use velcro. Some walls may have zippers and Velcro, but the Velcro is used for securing the wall to the tent top or corner legs. Your tent may also come with a storage bag and a sun visor. Pay attention to the Denier number of the tent top with the higher the Denier number, the better. A denier top of 300 should be the least you should purchase with a denier of 500 or 600, being better. Do not purchase a tent that does not list the denier number or at least call the manufacturer or retailer and ask first. Since shipping is expensive, compare prices based on the total tent and shipping costs since some stores include shipping in the price. If you are new to tents or setting up tents, the following short videos will be very helpful. When you put up your tent for the first few times, you will probably need someone to help you. You will eventually be able to do it by yourself. Below you will see a variety of common tents that you will see at art shows such as the Trimline, Caravan and the EZ-up. I recently saw a Undercover tent at an art show and was impressed so I also listed that brand. I also purchased one and find it of good quality. The very high quality professional TrimLine Canopies are made by Flourish at http://www.flourish.com. These tents take a while to put up because they are not the pop up type. This tent will hold up in strong winds and bad weather better than most tents. These tents would be best for those who do many 2 or 3 days shows, full time professional artist participating in many art shows or do art shows in locations in which it rains a lot or often run into bad weather. The high quality professional line of Caravan Canopies can be seen at http://www.caravancanopies.com. The Caravan tents are also easy to put up. Note: One tent in the Caravan line that seems to be popular on Amazon is listed above. You will need to buy the sides separately which are also sold at Amazon. See the Undercover tent review, showing details on three models in another blog. The reasonably quality and very popular EZ-up tents can be seen at http://www.ezup.com. The EZ-up type tents have been on sale for about $300 lately. I do not recommend you buy a tent from Costco or Sam’s club unless you can verify the tents specs to make sure they meet your needs. There are different quality levels of EZ-up type tents and they are not all the same. With online vendors, you usually get a list of information about the different tents specs, features and accessories offered in the box. When the manufacture says that this line of their tents are “Professional” or “Commercial”, then these are the higher quality tents. I started out with an EZup Encore II tent and used it for many years. The weather is usually good here in Arizona and I do not run into a lot of bad weather. I mostly worry about wind. You will not get the same protection from wind and rain from an EZ-up tent as a higher end Trimline tent, but they are much less expensive and faster to put up. The standard walls for an EZup are not as high quality as what would come with the Caravan or Trimline tents but are used by most artist with good results. You can also purchase thicker and higher quality walls for your EZup later at an additional cost. EZ-UP ES100 S with sides can also be purchased at Amazon at picture link to right. Z-Shade commercial tent with zippered sides can also be purchased at Amazon at picture link to right. E-Z Up Express II tent without sides can also be purchased at Amazon at picture link to right. Zshade Pop Up Canopy with velcro attached sides.